ABOUT THE GAMESet of Men of War: Assault Squad and 5 DLCs KEY FEATURESMEN OF WAR: ASSAULT SQUAD is a new game in the Men of War series. It takes place across the globe during World War II and features a completely new cooperative skirmish game mode. It includes access to five different nations (Russia, Germany, USA, Commonwealth and – for the first time ever in the Men of War series – Japan) a… s well as increased realism and accessibility. Assault Squad delivers an intense new WW2 spectacle with almost limitless replayability. Various historical settings and battlegrounds. Unique special units for every nation. Fantastic bonus abilities. Improved and dynamic AI. Huge variety of scenario locations including Western and Eastern Europe, North Africa and the Pacific. New multiplayer maps and game settings, improved multiplayer balancing, multiplayer player limit for LAN and Internet is 16 players, 4 is for skirmish. Overhauled infantry squads, more realistic weapon behavior and penetration values, a reworked artillery system, new types of ammunition. 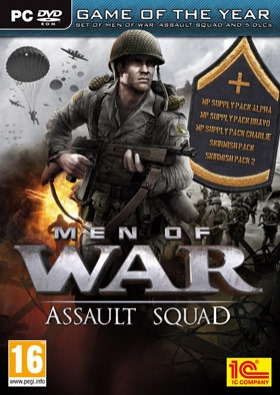 5 DLCs MP Supply Pack Alpha is the first official DLC for Men of War: Assault Squad and features 5 new competitive multiplayer maps for various numbers of players. Each map has its own unique setting and battle landscape. The 5 new multiplayer maps are for the gamemodes Assault Zones and Combat. MP Supply Pack Bravo is the second official multiplayer DLC for Men of War: Assault Squad and features 5 new competitive multiplayer maps for various numbers of players. Each map has its own unique setting and battle landscape. The 5 new multiplayer maps are for the gamemodes Assault Zones and Combat, as well as for the DLC exclusive Day of Victory gamemode. MP Supply Pack Charlie is the third official multiplayer DLC for Men of War: Assault Squad and features 5 new competitive multiplayer maps for various numbers of players. Each map has its own unique setting and battle landscape. The 5 new multiplayer maps are for the gamemodes Assault Zones and Combat, as well as for the DLC exclusive Day of Victory gamemode. Skirmish Pack Receive a full set of 5 new skirmish missions, 1 for each faction, USA, Germany, Soviet Union, Commonwealth, Japan. Objectives of the missions provide a completely new challenge as your task is to defend strategic positions against waves of enemy troops to hold out long enough to launch a counter attack and finally defeat the enemy. High replayability is guaranteed thanks to smart AI and up to 8-player coop. Skirmish Pack 2 Receive a full set of 5 new skirmish missions, 1 for each faction, USA, Germany, Soviet Union, Commonwealth, Japan. Mission objectives provide a completely new challenge as your task is to infiltrate enemy lines, assassinate enemy officers, stop convoys and capture strategic positions to support on-going allied offensives. Randomly generated strategic positions, defenses and enemy patrols ensure great replayability.SYSTEM REQUIREMENTS Minimum: Operating System: Windows XP SP3, Windows Vista SP1, Windows 7 CPU Processor: Intel Pentium 4 3GHz or AMD Athlon 64 3000+ Memory: XP – 1 GB RAM, Vista/Windows 7 – 2GB RAM Hard Disk Space: 6.5GB + 1GB Swap File Sound Card: DirectX 9.0c compatible sound card Video Card: Shader Model 3.0 compatible graphics card with 128MB Video Memory Media Required: 6x DVD-ROM drive Windows XP/Vista/7 compatible mouse and keyboard with latest drivers This product does not support Windows 95/98/ME/2000/NT.Recommended: Intel Core 2 Duo 2.33GHz or AMD Athlon 4400+ Shader Model 3.0 compatible graphics card with 256MB Memory: 2GB RAM Please refer to your hardware manufacturer for 100% DirectX compatibility.Multiplayer Requirements: Internet(TCP/IP) or LAN(TCP/IP) play supported Internet play requires broadband connection and latest drivers LAN play requires network interface card with latest drivers © 2012 1C Company. Developed by Digitalmindsoft. All rights reserved. This product contains technology licensed by Best Way. This product contains software technology licensed from GameSpy Industries, Inc. © 1999-2012 GameSpy Industries, Inc. GameSpy and the «Powered by GameSpy» design are trademarks of GameSpy Industries, Inc. All rights reserved. Uses Miles Sound System. Copyright © 1991-2012 by RAD Game Tools, Inc.